Scott Greinger, Extension Animal Scientist – Sheep,Virginia Tech. Some important topics to consider with the beginning of lambing season just around the corner. Proper management and nutrition of the ewe flock during mid and early lactation are critical for optimizing flock productivity and profitability. Balanced nutrition, coupled with proper management during gestation is important for fetal development, lamb vigor and survival at birth. Additionally, proper nutrition during gestation is important to prevent nutritional disorders which may impact the health and performance of the ewe and her lambs, and influences milk production of the ewe. fetal number (single, twins, triplets). Nutrients of primary interest include energy (TDN), crude protein (CP), calcium, and selenium. Following breeding, there is a relatively small increase in ewe nutrient requirements during the first 15 weeks of gestation. Requirements for a 175 pound ewe during early and mid-gestation are 55% TDN and 9.4% crude protein on a dry matter basis (at an intake of 3.3 pounds dry matter per day). 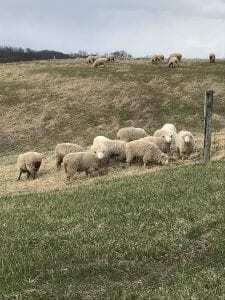 Often, ewes are grazing during early gestation, and in most cases forage alone will meet or exceed their nutritional needs, and in many cases ewes will gain weight during this period while grazing fall pastures. For winter-lambing flocks, ewes will make the transition from pasture to a diet of harvested feedstuffs during mid gestation. When feeding hay becomes necessary, it is important that the quality and quantity of hay being fed be closely considered. To properly balance rations and control costs, an accurate forage analysis should be conducted on all hays (cost of $10-15). There can be significant variation in hay harvested from the same field at the same time, and certainly from one cutting to another. 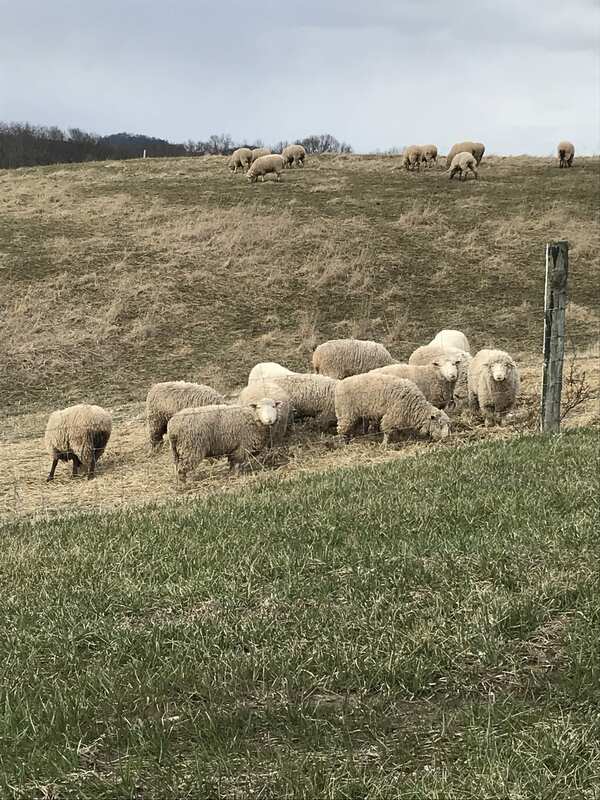 Average quality grass or grass-legume hays typically will meet the ewe’s requirements during mid gestation, and if ewes are allowed to consume all the hay they will eat many hays will supply considerably more nutrition than required. This emphasizes the importance of saving high quality hays for feeding during lactation, when ewe nutrient requirements are much higher compared to gestation. If high quality hays, such as alfalfa, are fed during mid gestation it is important to limit intakes. Overfeeding during this period is costly, and may also result in over-conditioned ewes leading to complications later in the production cycle (ketosis, lambing problems). Approximately two-thirds of the birth weight of a developing fetus is gained during the last six weeks of gestation. As a result, the nutritional requirement of the ewe for both energy and protein increases during this time. For a 175-pound mature ewe, TDN requirements increase to 57-66%, compared to 55% during early gestation. Similarly, crude protein requirement increases to around 11%. The most critical difference is the increase in energy requirement, particularly during the two weeks prior to lambing. Inadequate nutrition during late gestation may result in pregnancy ketosis, light birth weights, weak lambs, and lower milk production. Energy and protein requirements are also influenced by expected lambing rate, with increased requirements for ewe carrying multiple births. In larger flocks, ultrasound diagnosis of fetal numbers can be an excellent management tool by creating an opportunity to feed ewes carrying singles vs. twins vs. triplets separately. Total energy intake requirements in late gestation increase 16% for twin and 31% for triplet-carrying ewes compared to ewes carrying singles. Similarly, total crude protein requirements increase 23% and 45% for twin and triplet carrying ewes, respectively, compared to singles. These increased requirements can be supplied by providing additional hay and grain for multiple birth ewes, and/or providing a more nutrient dense diet. Grain supplementation should begin earlier for multiple birth ewes (3-6 weeks pre-lambing) than ewes carrying singles (2 weeks pre-lambing). Many shepherds utilize the rule of thumb that ewes should receive on pound of grain supplement for each lamb they are carrying. Selenium and Vitamin E are critical nutrients during gestation. 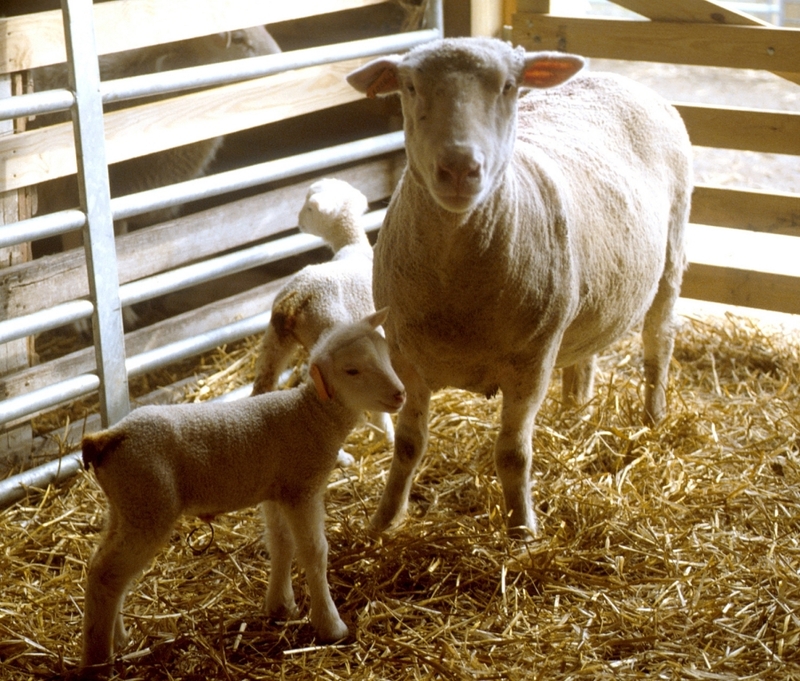 Selenium is passed from the placenta to the fetus during late gestation, and proper selenium supplementation to ewes will assist in preventing white muscle disease in lambs. Selenium is often provided in complete mineral mixes offered free-choice (provide mineral specifically formulated for sheep). For flocks with a history of selenium deficiency, selenium should be added to the grain mix fed to ewes to insure intake. FDA regulates that selenium concentration in free-choice mineral mixes not exceed 90 PPM, and limits total ration concentration of selenium to 0.3 PPM (intake of 0.7 mg/hd/day). While selenium is a very important trace mineral that is required in small quantities, care should be exercised in formulation as higher intakes can be toxic. Late gestation ewes with inadequate calcium intakes are prone to milk fever. The calcium content of grains is low, whereas forages such as alfalfa hay are generally higher in calcium. Calcium intake should be monitored closely, particularly when feeding corn grain and hay diets. Supplemental calcium may be provided through a complete grain mix. Ewes should be vaccinated for clostridium perfringes types C & D and tetanus three weeks prior to lambing. Vaccination of ewes will provide protection to their lambs at birth. Finally, inventory lambing supplies and prepare facilities well in advance of the lambing season. Early preparation for the lambing season will result in more live lambs saved and enhance potential profitability of the sheep enterprise. Posted by Braden Campbell at 8:00am November 7, 2018 Posted in Management and tagged Management, Nutrition. Bookmark the permalink.